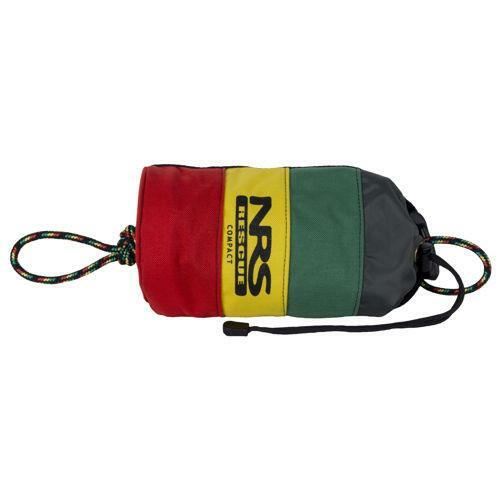 The NRS Compact Rasta Rescue Throw Bag does more than make you smile every time you look at it. It's also a must-have safety tool to help you and your buddies in swiftwater emergency situations. Compact size rescue bag fits easily in tight spaces such as kayak cockpits while performing much like a standard size throw bag. Rugged Cordura® bag has bands of red, yellow and green that are highly visible in varying water colors and conditions. The 1/4" polypropylene rope also has red, yellow and green woven into it for visibility. The rope has a 1,000 pound tensile strength, and it floats on the water for good visibility and easier grasping.